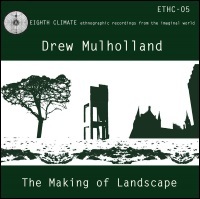 Drew Mulholland is currently employed by University of Glasgow as Composer in residence for both the Astronomy and Physics department and the Geographical and Earth Sciences department. His works for the Geography department have included 'Geographia Mundi', a suite in three movements evoking cartographers and explorers, with one section sung in Latin and another based on magickal symbols from Reginald Scot's The Discovery of Witchcraft, while 'Stella Nova' composed for the Astro-Physics department centred on the "nebular hypothesis" and the belief that stars evolved from space dust. Both recordings featured on The Norwood Variations a criminally short-run CD released by Strange Attractor. Drew Mulholland is perhaps best known for The Séance At Hobs Lane, the second album from Mount Vernon Arts Lab which established him as one of the key proponents of psychogeography, a term that Mulholland was unaware of at the time. Aided by an impressive cast including Scottish friends such as Teenage Fanclub's Norman Blake, Electroscope's John Cavanagh, Isobel Campbell, as well as Coil, Add N to (X)'s Barry 7, Portishead's Adrian Utley, The Séance At Hobs Lane was a psychic drift through the cobbled streets of London via Hobs Lane tube station (a fictional stop featured in Quatermass and the Pit) with sojourns into opium dens and clandestine meetings of secret societies populated by mischievous spirits and the ghosts of Sir Francis Dashwood, Thomas De Quincey, Percy Toplis. A previous Mount Vernon Arts Lab, release One Minute Blasts Rising To Three And Then Diminishing was recorded live in a decommissioned command centre located deep underground some 100ft below in Troywood, Fife. The Making Of Landscape is a site-specific recording that encompasses his obsession with psychogeography straddling both academia and sound research as he explores the archaeology of this ancient ceremonial complex. For The Making Of Landscape Drew Mulholland travelled to Cairnpapple Hill near Bathgate, in West Lothian, Scotland with a VLF receiver to record the radio emissions of the ancient burial mound and surrounding henge. The hand-held device used by Mulholland was devised to capture electromagnetic signals from lightning storms and from the Earth's magnetic-field, known as the magnetosphere. At Cairnpapple Hill Drew Mulholland, like a modern day audio dowser, set about an exploration of the archaeological site to capture the naturally occurring radio transmissions emanating from the site - and perhaps some sound remnants from the nearby mobile phone mast that blights the landscape here. On 'The Path To The Cairn' the hovering drone shimmers with a restless intensity mapping the ascent on the stone steps to the summit, which on a clear day offers views to the mountainous peak of Goat Fell on the Isle of Arran on the west and to the Berwick landscape in the east. It's a beguiling sound, as the hand-held device picks up the rustling shudders and tremors, tweaks and occasional whistle emitting from the earth. From the peak, Mulholland descended to the interior and to the North Grave, an ancient burial structure comprising an upright burial stone flanked by a circle of kerb stones. The opening quickening sound flashes of 'The North Grave' flicker with an otherworldly sound like the science fiction electronica created by the BBC Radiophonic Workshop and Mulholland's beloved Delia Derbyshire. It settles into unsettling textures of free-falling whistler effects, rumbling and explosive sound shudders and processed electronics. Cairnpapple Hill is a complex ceremonial structure. The summit contains several burial mounds while the ensuing henge features burial mounds both Bronze age and Christian. It is obviously an area revered by the local population over the centuries and perhaps it is this meaning that Mulholland extrapolates on 'Have I The Rite? ', a title blatantly channelling Joe Meek, the visionary sixties music producer. In between recording the Honeycombs and composing the futuristic 'Telstar' for The Tornados, Joe Meek sought out the dead, and specifically Buddy Holly, via the séances he regularly attended, an obsession reflected in John Leyton's pop-hit 'Johnny Remember Me'. It's a quiet almost reverential piece, where the oscillating electronic hum takes the form of a sound pitched somewhere between organ chime and perhaps more aptly a pipe drone. It unfurls into static laced electronic drone, its nebulous tones seeking out the emotions and energy impressed on the burial mounds and stone cairns; eking out a melody that has long slumbered in the soil and stones of the ancient landscape. 'Neothilia', the final piece on The Making Of Landscape, is a twenty minute sound excursion; a ringing shield of reverberating sound waves veering between harsh discordant noise and harmonious tones. Time stretched and reverb filled it's a probing and penetrating track, representing Mulholland's journey to Cairnpapple, perhaps closer to the time-stretched excursions of his one-off Mount Vernon Astral Temple release on Coil's Eskaton label.